This video (3:32 minutes)— explores the ways Rockbrook inspires creativity through its many arts and crafts, and performance-based activities. I think we go out of our way to provide the creative outlets here. The pottery program. We have two pottery studios and some competent instructors, like it’s second to none, and also another interesting creative experience would be drama. Drama is a huge part of Rockbrook, but it’s not just in the classroom. We have skits every night at evening program, we have so many dress-up days like like grainy bingo, and twin day. Whenever someone goes on a trip, they come up with a song or skit and they perform it at meal times, and everyone just gets really into it. Singing is also a big tradition at Rockbrook. Most of the time singing happens in the dining hall. A lot of them are very silly, they will get you banging on the table and clapping their hands, and energy in the dining hall, is just wonderful. They can do dance, drama class, or take part in the camp play. Just in directing the play, it’s amazing seeing people who have obviously never done any theater before really just open up and get so comfortable on stage, and just let go. It’s an amazing thing to watch. There are a ton of arts and craft activities. If you want to learn how to weave or do a tie dye t-shirt, make a bracelet. We actually have two pottery studies for all the girls to take one of our ceramics classes. The camp has always encouraged creativity among the campers and I think one of the things I have noticed is that at camp you are free to be who you are. You are not constrained by some identity that has been imposed on you in your home environment or in your schools setting or something like that. You come to camp and just be who you want to be. I have heard a lot of camper express that – putting on the costumes and things like that, we provide the opportunity but campers usually bring those things to camp with them and love to dress up, and love to play make believe and the evening programs encourage that kind of creativity, and it’s kind of a wholesome way to get back to learning that you don’t have to have a lot of sophistication just to enjoy yourself and be yourself. I think we go out of our way to provide the creative outlets here. The pottery program. We have two pottery studios and some competent instructors, like it’s second to none, and also another interesting creative experience would be drama. Drama is a huge part of Rockbrook, but it’s not just in the classroom. We have skits every night at evening program, we have so many dress-up days like like grainy bingo, and twin day. Whenever someone goes on a trip, they come up with a song or skit and they perform it at meal times, and everyone just gets really into it. Singing is also a big tradition at Rockbrook. Most of the time singing happens in the dining hall. A lot of them are very silly, they will get you banging on the table and clapping their hands, and energy in the dining hall, is just wonderful. They can do dance, drama class, or take part in the camp play. Just in directing the play, it’s amazing seeing people who have obviously never done any theater before really just open up and get so comfortable on stage, and just let go. It’s an amazing thing to watch. There are a ton of arts and craft activities. If you want to learn how to weave or do a tie dye t-shirt, make a bracelet. We actually have two pottery studies for all the girls to take one of our ceramics classes. The camp has always encouraged creativity among the campers and I think one of the things I have noticed is that at camp you are free to be who you are. You are not constrained by some identity that has been imposed on you in your home environment or in your schools setting or something like that. You come to camp and just be who you want to be. 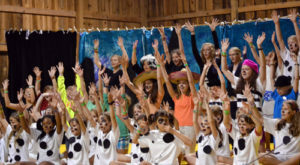 I have heard a lot of campers express that – putting on the costumes and things like that, we provide the opportunity but campers usually bring those things to camp with them and love to dress up, and love to play make believe and the evening programs encourage that kind of creativity, and it’s kind of a wholesome way to get back to learning that you don’t have to have a lot of sophistication just to enjoy yourself and be yourself.